The first recorded micro miniature roses date back to the early 19th century in Europe. Among them are the Pompon De Paris, which has its earliest origins dating back to 1839 where it was reportedly sold in French street markets as a potted planted. Another is the R. Roulettii, which supposedly was discovered in Switzerland sometime around 1918 by Major Roulet, which is the basis for their namesake. There seems to be some argument among avid growers of micro roses as to what is truly a micro rose. Many will simply call certain modern varieties "micro" because of the small size of their blooms, even though the rest of the plant tends to grow as large and as full as other full size types of roses. In general, micro roses will stay very short with some only reaching 6 to 8 inches tall at full maturity. You can expect to find other varieties grow as high as 15 to 18 inches, and even some that get as tall as about 2 feet. Beyond that however you will encounter much dispute as to their true nature as a micro. Growing micro miniature roses is not much different from growing their larger cousins, only the proportions are different. Most often micro roses are grown in containers, which means you have to pay a little extra attention to them. Like most roses, they like to have a lot of sun light. At a minimum you should be providing them with at least 6 to 8 hours each day of direct sun light. More sun light is even better if you are able to provide it. You should also keep your micro roses in soil that drains well. This is not always an issue when grown in containers as most gardeners use their favorite potting soil. If you are growing them directly in the garden, then this is more of a concern. If you are unsure of the quality of your garden soil, try mixing in a little organic compost with the soil at a ratio of 1 part compost for every 2 parts soil. This is actually a great mix for most plants but roses especially love it. Getting your micro miniature roses into a container or flower bed is a pretty simple task. If you picked up your roses from a local nursery, there's a good chance that they were already planted and established in a container. These are the easiest to transplant because the guesswork is already done for you. Dig yourself a hole that is at least twice the diameter of the container, and equally as deep. 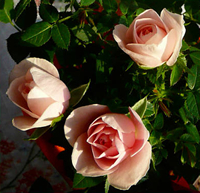 If transplanting to a larger container, try to double the size that the rose originally came in. This gives you plenty of room for your new soil mix, while still keeping the bud union at its current depth. If you bought your micro roses online, then they may have shipped them to you as bareroot plants, which is very common. You should first soak these overnight in a bucket of room temperature water prior to planting day, to rehydrate the roots. Then dig your hole as wide as the longest roots on the plant, and plenty deep enough so that you can mound up some soil in the center of the hole to set the plant on, and still keep the bud union an inch or two below the surface. When you back fill the hole, make sure that you water the loose soil heavily so it completely covers the roots. 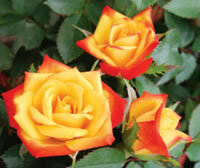 One of the biggest considerations when caring for micro roses is the water requirements. This is especially true if you are growing them in containers. Be sure to check the soil around the base of the plant every couple of days to be sure that you are not letting them dry out for too long. A good rule of thumb is usually to provide your roses with one deep watering every week. If you live in a hot or dry climate, you may need to bump that up to every 4 to 5 days. 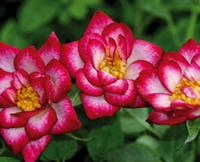 Micro roses tend to be vigorous growers and profuse bloomers. You should give them a dose of a good fertilizer in the early spring when the leaves begin to develop. Being repeat bloomers, they will do very well if you give them a couple of additional feedings over the growing season. I will often give my roses a second feeding right after the first big bloom, and then a third feeding sometime around the middle of summer to encourage late season blooms. 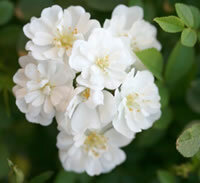 You should prune your micro miniature roses in the early spring just before the leaves begin to form. This makes it much easier to see what you are doing. Start by cutting away all the dead wood, along with any canes that are discolored. Then go through and carefully prune back all the smaller lateral canes that overlap one another because these will compete with each other for sun light once the leaves open. Then lastly, prune the remaining canes back by about one third of their current height. This is also the time you will want to clean up around the base of your micro roses and remove all the dead leaves and debris that has collected there over the winter. Throw away all this material in the trash along with your cuttings. 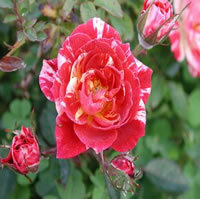 Never let decaying matter lay around your roses as they can become breeding grounds for certain pests and diseases. I always finish up my pruning by giving my roses a fresh layer of mulch to start off the new growing season.